It's finally here! We've been having so much fun this month getting ready for Halloween. Only problem is, all three of us came down with colds :(. We had such high hopes to get all dressed up and take Anders out in the neighborhood in our costumes. Instead we settled for a quieter Halloween, but we definitely had some fun! Derek knows that I love caramel apples... my mom used to make them for us when we were kids, and I will probably do the same when Anders gets a bit older, but this just wasn't the year for me to make this treat. Caramel apples seem a little finicky because double boiling anything just seems complicated. So instead Derek surprised me with this caramel apple from the store. It was the perfect treat to bring the Halloween mood on Monday. On Tuesday Derek started to get sick and looked pretty deadly when he came home from work. But after some apple pie (one of his favorite treats) he was happy to carve pumpkins and even got a little creative! 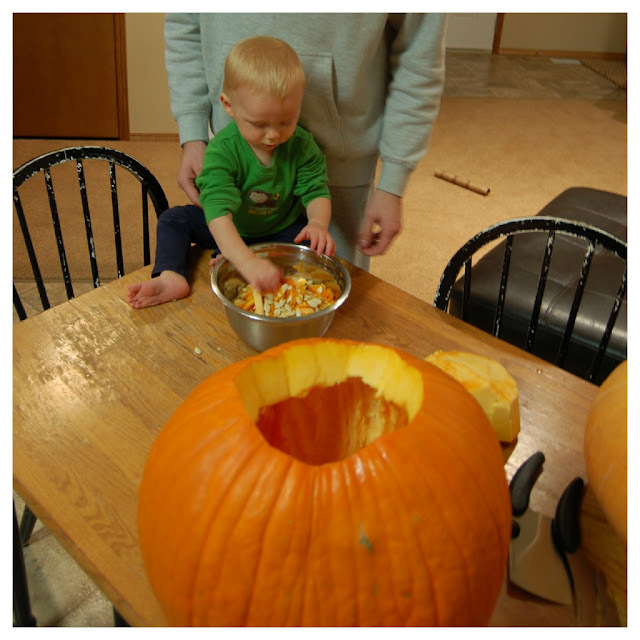 I was pretty excited to see how Anders would handle the pumpkin goo. Anders was a little tentative at first patting the seeds but before we knew it he was squealing away and had the bowl of seeds dumped all over the table. As for our pumpkins, Derek carved his own and I did one for Anders and I. Derek decided to carve a scary pumpkin and I did something fun. I found a cute idea online to use your baby's hands for eyes and I was so excited to use this idea to involve Anders. The little fingers were a hassle to cut out, but I'm happy with the result. I love your pumpkins and ghost decor. SO cute! Thanks for the fun ideas. Glad to know you still had fun despite your condition. Those photos are lovely esp those decors! Have a nice day! Btw, would you like to follow each other on gfc? let me know. Hope you're all feeling better Alexis! It's no fun being sick:(! Glad you had a cozy night indoors with the family! As for your comment on my blog, the pumpkin took a few hours to carve (maybe 2-3). It's pretty time consuming. And Casper and Hocus Pocus are my favorite movies too:))!